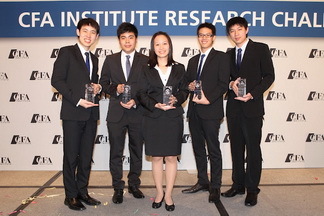 On April 12, 2012 the BBA team competed in the global Final round against 4 graduate student teams from Illinois Institute of Technology (Chicago), Rutgers University (New Jersey) and Stockholm School of Economics (Sweden). 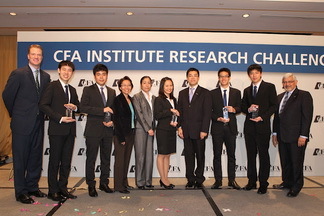 It was a long journey from where we started to our victory in CFA Institute Research Challenge, Asia Pacific. On March 2, 2012, an indescribable feeling of joy stuck us when the regional winner was announced to be Thammasat University. As elated as we were, we suddenly felt our half year�s efforts had paid off. The hard work had begun long before we secured the champion trophy in Hong Kong. Along the way was the experience we would cherish a lifetime. As a team consisting of five members, namely Jackrit Bumrungtrakul, Kittikiat Tantivuttikiti, Panus Hongrapipat, Sorawit Patumraj, and Wimolnat Tanganurakpongsa, we personified stock analysts and represented Thailand in the regional round in Hong Kong. Despite winning the local Challenge in January, we could not afford to remain complacent. Rather, we made a lot of modifications to the presentation by taking into account the set of different expectations of judges in the local and the regional rounds. Because of the audience�s lack of fundamental knowledge on CPALL � the subject company � we had to deliver a more thorough business overview. At the same time, peer evaluation was further emphasized; regional convenience stores and modern retailers were included in comparison with CPALL in several aspects. The adjustment of the presentation was vital as most regional judges were global fund managers replete with technical knowledge. To justify our strong BUY rating on CPALL, we had to convince them that CPALL was worth investing in, especially when viewed against other regional players. Beating 1,550 teams in Asia Pacific was not an easy task, yet achievable. The success cannot be attributed solely to us five. In fact, there are many people to whom we owe our heartfelt thanks. We are truly appreciative of Asst. Prof. Dr. Pantisa Pavabutr and Dr. Anchada Charoenrook, whose valuable tutelage and advice have put the team this far. Their tireless contribution to the team is of utmost importance and definitely one of the key success factors (together with the nourishing and scrumptious meals in Hong Kong). As well, we would like to thank CFA Thailand for the opportunity and its endless support. Our thanks go beyond to all advisers who have equipped us with knowledge necessary for the competition and to the BBA Office for its consistent support. The CFA Challenge was a great learning platform rather than a mere stage for competition. We have gained a great deal of knowledge, a great deal of friendship, and a great deal of fun. Looking forward, our team is preparing, as hard as usual, to compete in the global and final round in New York. The competition is scheduled on April 11, 2012, and we promise to deliver our best. Posted date: March 15, 2012 � 15:20 hrs.